It must be relatively rare for one very junior naval officer to get to participate in three separate armed conflicts within three years, but that’s what Naval Cadet (they weren’t called Midshipmen back in 1898) Joseph K. Taussig did. 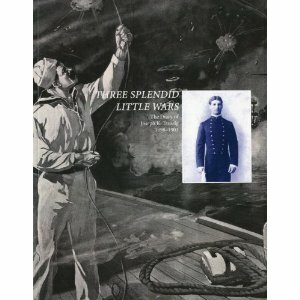 According to Three Splendid Little Wars: The Diary of Joseph K. Taussig, 1898-1901, published by the Naval War College, after being called away from the U.S. Naval Academy after the outbreak of the Spanish-American War, Taussig witnessed the Battle of Santiago de Cuba, wherein the Spanish fleet unsuccessfully attempted to outrun the American fleet. As part of the two years at sea required of Annapolis graduates prior to their commissioning exam, Taussig then sailed halfway around the world to help defeat Philippine revolutionaries in the Philippine Insurrection (mainly by embarking on an abortive hostage rescue mission). Since I’m particularly interested in the Boxer Rebellion, I thought that the last section of Taussig’s diary was by far the most engaging. Disembarking near the Taku forts that played such a prominent role in the Opium Wars of the 19th Century, Taussig and his Navy and Marine comrades headed up the Peiho River to the city of Tientsin, where they teamed up with the British, French, German, Russian, Japanese, Italian, and Austrian contingents to form the so-called Boxer Relief Expedition. At first thinking that they would reach the besieged legations in Peking in a day or so, they spent most of their time repairing Boxer-damaged railroad tracks until the Boxers cut the tracks behind them, forcing a grueling retreat back to Tientsin. Taussig’s impressions of the Boxer rebels and their fighting methods is interesting in itself, and his account shows how what initially seems to have been perceived as a walk-over soon became a grim contest against enemy troops, heat, and the ill-mapped Chinese terrain. It all ended for Taussig when “Although the bullets were flying thick I was never so surprised in my life when I felt a blow in my right hip that knocked me down.” He had been hit by a Boxer bullet. After long periods of being carried on a stretcher, Taussig eventually got medical help and lived long enough to become a Rear Admiral (he could well have risen further if he had not antagonized a certain Assistant Navy Secretary Franklin Roosevelt, who apparently did not forgive and forget when he became President – but that’s another story). Three Splendid Little Wars is a valuable primary source of information on some little-known conflicts and a “you are there” portrait of the frustrations suffered by the Boxer Relief Expedition in its prolonged struggle to relieve the foreign embassies in Peking. Future historians will have to take Taussig’s diaries into account when they retell that particular story. You can browse through it here, get a printed copy here, or find it in a library. This entry was posted on Wednesday, December 29th, 2010 at 9:30 am and is filed under U.S. Marines, U.S. Navy. You can follow any responses to this entry through the RSS 2.0 feed. You can leave a response, or trackback from your own site. That book is indeed a nice source of information and knowledge abut Joseph K., perhaps he had a great experience on that age and back to that time everything was really difficult. interesting read enjoyed it im a massive history nerd. Fascinating information on the boxer rebellion. I started learning kung-fu at University in 1992 and the subject came up then in a conversation about the origins of the style we were learning (Shaolin Hung Kuen, from the Wong Fei Hung line, apparently). Ironic to learn that it was against the British, and there were were, learning Chinese boxing for ourselves. NOTHING IS WHAT IT SEEMS!NO MISTAKES IN ANY WAR!NEVER BE UNDERESTIMATE ANY OPPONENT! Thank you for this blog. It has improved my quality of life for 2010! I look forward to the upcoming adventures for 2011!